In less than one week I will board a plane for Amsterdam where, the following Sunday, I will hang out with the rest of the gang from Pinhole Obscura for Worldwide Pinhole Photography Day. To say I am excited is an understatement. This will be the first time meeting my friends in real life, and hopefully it will be the first of many times we are able to get together to play pinhole. 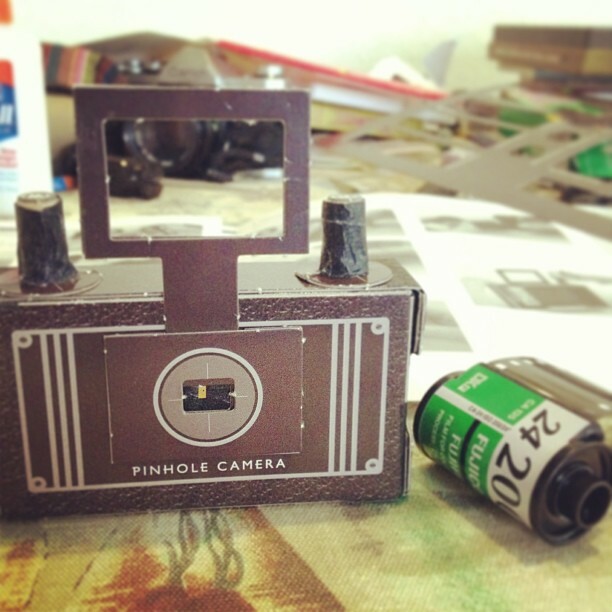 We will feature a post on this blog sometime in May with pinhole photos from the day, so keep an eye out for that! I thought it might be fun to write a post about my entry for WPPD last year. 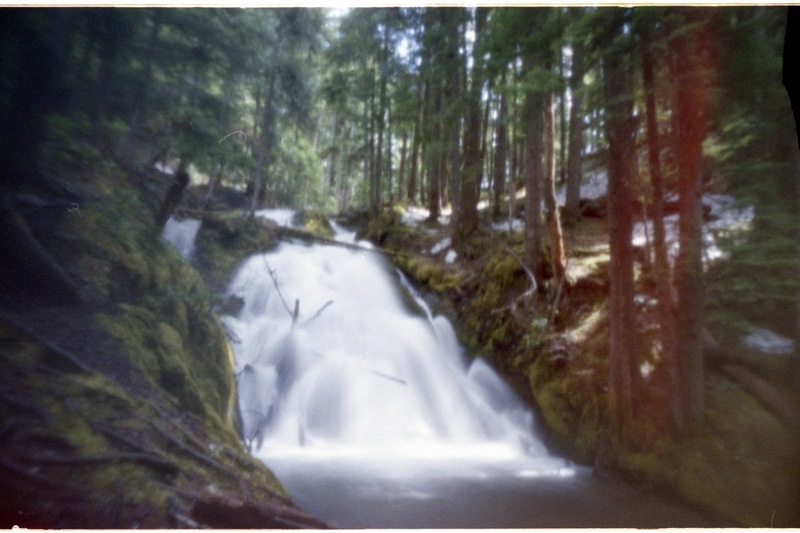 A few weeks before WPPD I found a pinhole camera kit I had stored in my closet for years. I looked through the kit many times in the past but always became overwhelmed by the instructions and would promptly put it away. But last April I decided to try putting it together. I was successful and I took a few shots around my neighborhood with it. When I shared the photos Inge alerted me to the fact that WPPD was coming up! So I used the same camera for my submission, which you will see below. I used Fuji Superia and I haven’t a clue how long I exposed it for, let alone the size of the pinhole and any other technical details. You can see more photos from that day here. This is Little Zig Zag Falls. 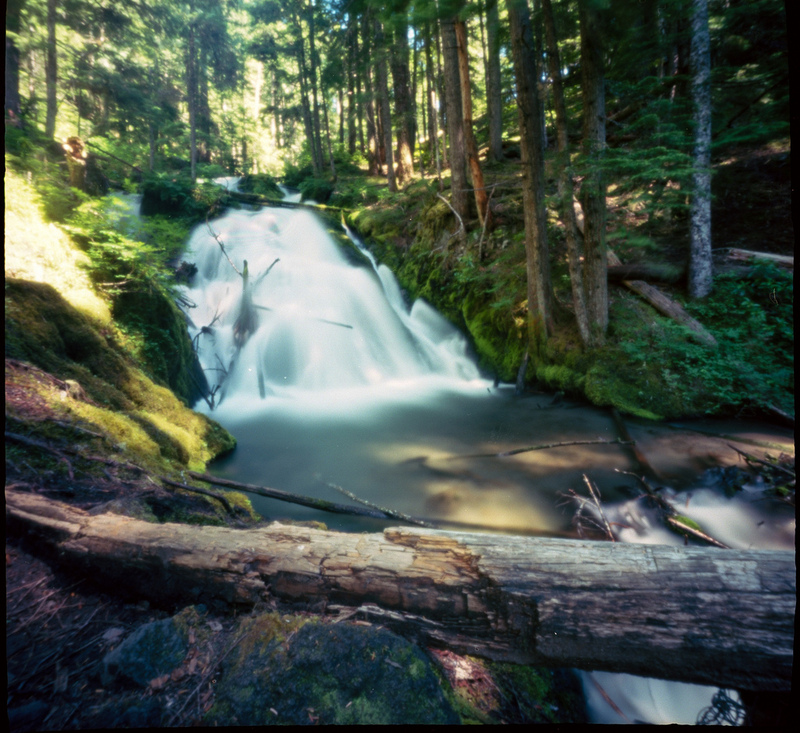 Little Zig Zag Falls is on Mt Hood, near Government Camp. It was one of the first places I visited when I first moved here and I love coming back as often as I can. It is a quick drive from the main highway and a short, easy hike. And wow. Such a beautiful place. It is covered in snow most of the year, and I had to hike through snow to get the photo above for WPPD. But when Summer finally arrives I am up here almost every weekend. Below is a photo I took from my the same spot with my Zero 2000 in July 2013. I believe this was my Zero’s first outing! Here is my latest post on Pinhole Obscura (been a long time)..